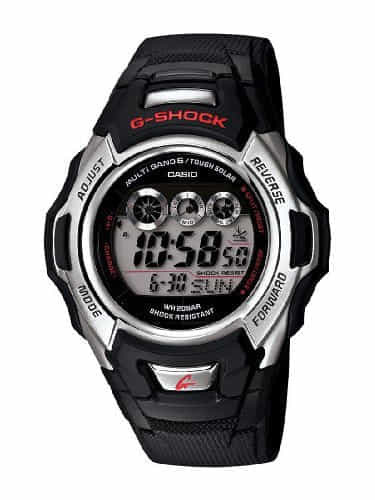 G-Shock Mens Watch... With full 200M WR Shock Resistant 24 Hour stopwatch and countdown timer standard issue never looked this good. 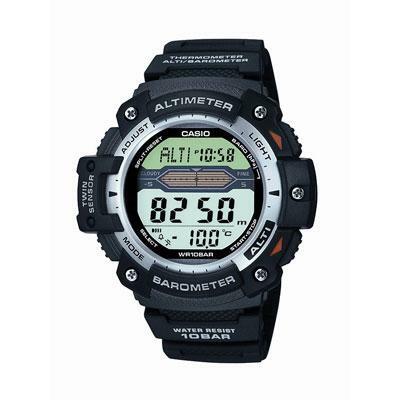 Shock Resistant; 200 Meter Water Resistant; EL Backlight with Afterglow; Daily Alarm; Countdown Timer; Input range: 1 minute to 24 hours; Measuring unit: 1 second; Auto-repeat function; 1/100 second stopwatch; Measuring capacity: 23:59'59.99"; Measuring unit: 1/100 second (for the first 60 minutes); 1 second (after 60 minutes); Measuring mode: elapsed time split time 1st-2nd place times; Hourly Time Signal; Auto Calendar (pre-programmed until the year 2039) 12/24 Hour Formats; Accuracy: +/- 15 seconds per month; Battery: 2 years on CR2016. This item cannot be shipped to APO/FPO addresses. Please accept our apologies. 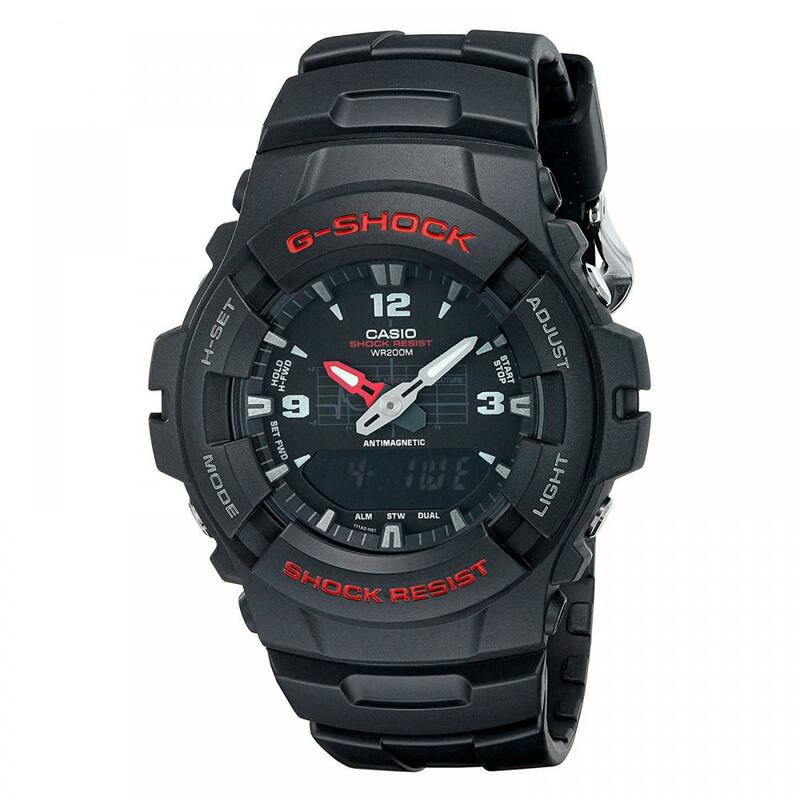 Casio analog-digital resin Gshock. Shock Resistant 200M Water Resistant Magnetic Resistant EL Backlight with Afterglow Dual Time Daily Alarm 1/100 Second Stopwatch Measuring capacity: 23:59'59.99" Measuring unit: 1/100 second (for the first 60 minutes) 1 second (after 60 minutes) Measuring mode: Elapsed time Auto Calendar (pre-programmed until the year 2039) 12/24 Hour Formats Accuracy +/- 15 seconds per month Battery CR2016 Approx. battery life: 3 years This item cannot be shipped to APO/FPO addresses. Please accept our apologies. 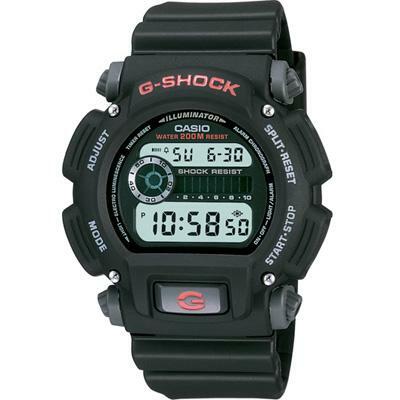 Casio G-Shock Watch. 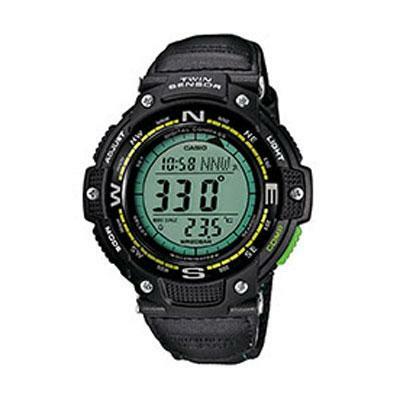 Shock resistant 200M water resistant EL backlight Multifunction alarm and 1/100 second stopwatch. Black w/ Black Band This item cannot be shipped to APO/FPO addresses. Please accept our apologies. 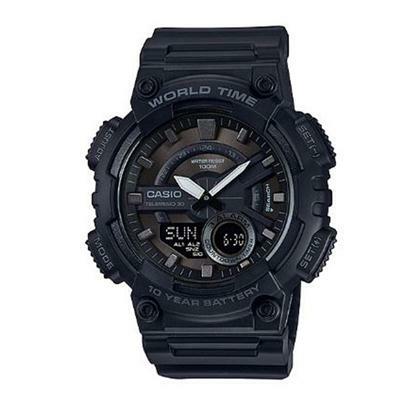 This Solar Atomic model is based on the original DW6900 model G-Shock's best-selling case design. With this model a Solar Atomic Timekeeping system was employed without changing the basic design of the watch. This makes it possible to generate power to keep the watch running with extreme accuracy and minimal exposure to normal lighting. This simple design was achieved by eliminating as much coloring and decoration as possible and the result is a model that captures the essence of the basic G-Shock. This item cannot be shipped to APO/FPO addresses. Please accept our apologies. 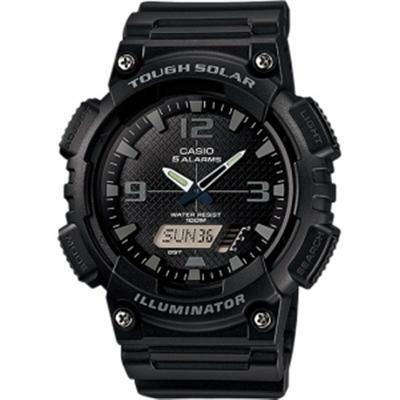 Casio Tough Solar Ani-Digi Watch Matte Black/Grey. Utilizing a unique Self-Charging solar power system this sporty analog/digital combination model provides plenty of functionality. A host of features such as 48-city world time 5 alarms stopwatch and dual countdown timers make this a versatile timepiece for almost any sport outing. This item cannot be shipped to APO/FPO addresses. Please accept our apologies. 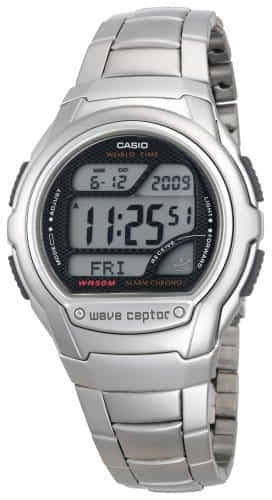 CASIO ATOMIC TIMEKEEPING DIGITAL WATCH. 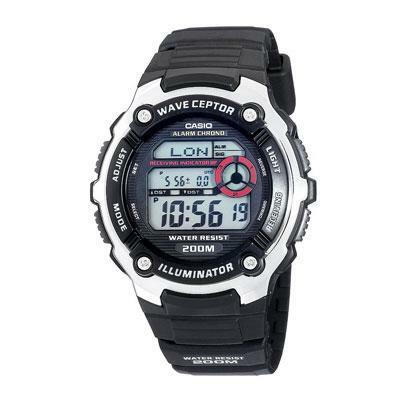 Silver Digital Wave Ceptor Watch with Metal Band featuring Countdown Timer World Time 1/100 Second Stopwatch and EL backlight with Afterglow. Multi-Band Atomic Timekeeping (US UK). 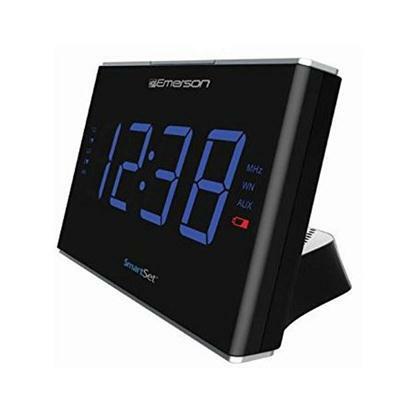 Receives time calibration radio signals which keep the displayed time accurate. 50M Water Resistant. 29 times zones (48 cities) city code display daylight saving auto/on/off. Daily Alarm. This item cannot be shipped to APO/FPO addresses. Please accept our apologies. 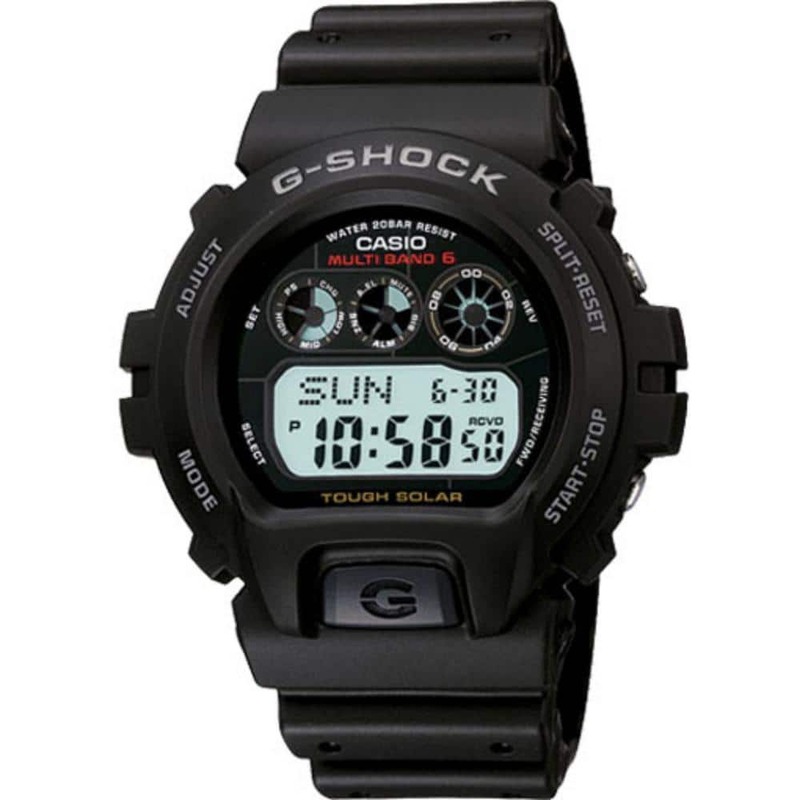 Casio G-Shock Watch. 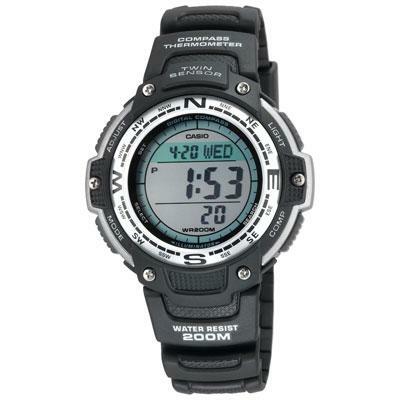 Shock resistant 200M water resistant EL backlight Multifunction alarm and 1/100 second stopwatch Black with Black Band. This item cannot be shipped to APO/FPO addresses. Please accept our apologies. 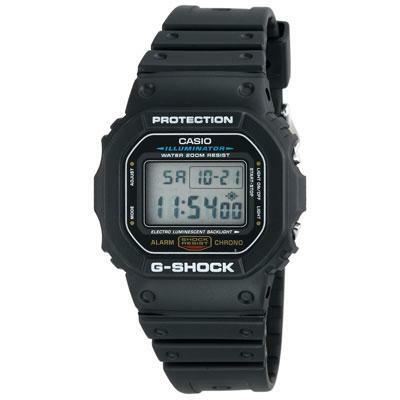 CASIO FISHING TIMER ANA-DIGI BLACK WATCH. SPORTS GEAR is the watch designed and engineered to perform tasks that go above and beyond simple timekeeping and these new models are no exception. Outdoor essential features such as Moon Data thermometer Fish Indicator and more come packed in a configuration that is water resistant up to 200-meters. EL Backlight with afterglow. Fish Indicator. Moon Data. Thermometer. This item cannot be shipped to APO/FPO addresses. Please accept our apologies. 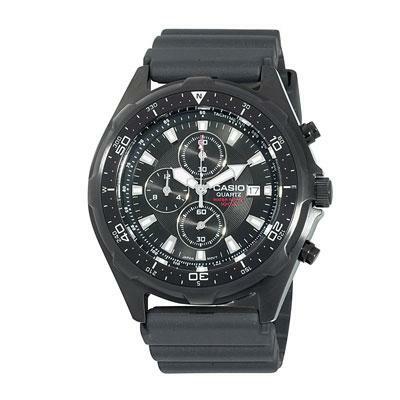 Casio Mens Black Ana Digi Watch AEQ110W-1BV This item cannot be shipped to APO/FPO addresses. Please accept our apologies. FUSION MINI HIDDEN LED� KIDS WATCH� BLUE CODK52531BL � • Animated Hidden L.
Display� • One-Piece Silicone Mini Case and Band. 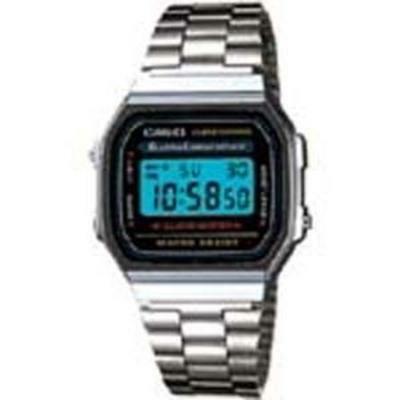 Casio 50M Water resistant Electro-Luminescent backlight 1/100 second stopwatch Measuring capacity: 59'59.99" Measuring mode: elaped time split time 1st-2nd place times Daily alarm Hourly time signal Auto-Calendar 12/24-hour formats accuracy+- 30 seconds per month. This item cannot be shipped to APO/FPO addresses. Please accept our apologies. MedCenter, Sport Reminder Watch, #4646-6. Durable sports watch with up to 5 daily alarms, Easy to read display, regular or military time format, 100 year calendar, 150 lap memory digital chronograph, countdown timer, dual time function. Water resistant to 50 meters, EL back light, PU strap. 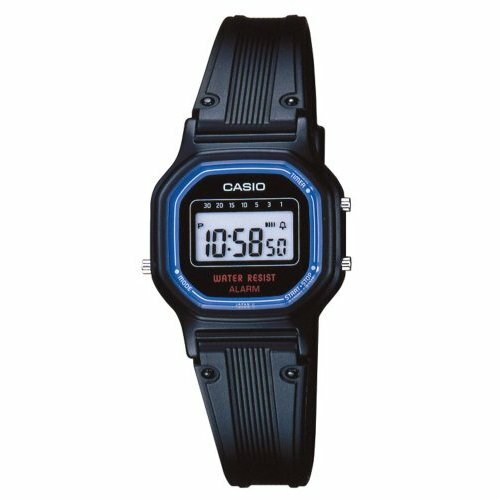 Casio Water resistant Electro-Luminescent backlight 1/100 second stopwatch Measuring capacity: 23'59.99" Measuring mode: elaped time split time 1st-2nd place times Daily alarm Hourly time signal Auto-Calendar 12/24-hour formats accuracy+- 30 seconds per month. This item cannot be shipped to APO/FPO addresses. Please accept our apologies. Acer Leapware L05 Red Smartwatch This item cannot be shipped to APO/FPO addresses. Please accept our apologies. 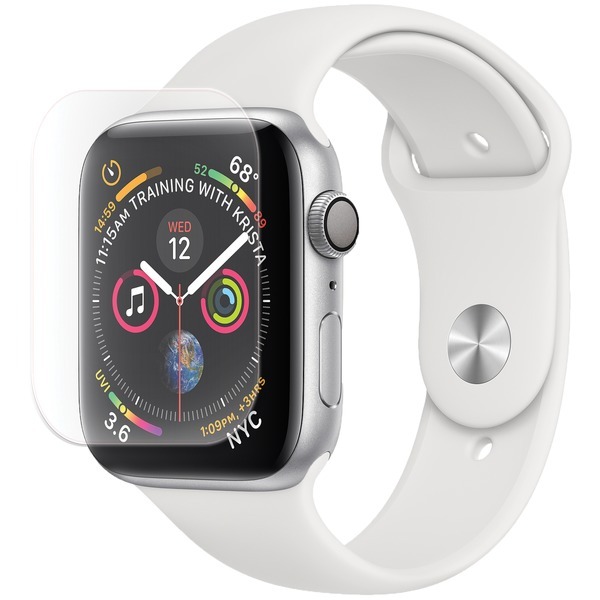 1.1" Touch; Round 218x218; Purple; Closed OS; MT2523D; 4MD Flash + 4MB RAM; Capacitive Touch Gorilla Glass; This item cannot be shipped to APO/FPO addresses. Please accept our apologies. Casio Twin Sensor Watch. This watch has twin sensor capability Digital Compass and Thermometer. It also is low temperature resistant. It has EL Backlight with World time 5 daily alarms w/Snooze Alarm 1/100 second stopwatch and countdown timer. 200M Water Resist. Black Band. Measuring unit: 1 degree 10 seconds continuous measurement Graphic direction pointer Bearing Sensor Correction Magnetic Declination correction Thermometer Display range: -10 to 60 C (14 to 140 F) Display unit: 0.1 C (0.2 F) EL Backlight with Afterglow World Time 29 times zones (48 cities) city code display daylight saving on/off 4 Daily Alarms and 1 Snooze Alarm Countdown Timer Measuring unit: 1 second Countdown range: 24 hours Countdown start time setting range: 1 minute to 24 hours (1-hour increments and 1-minute increments) Others: Auto Repeat 1/100 second stopwatch Measuring capacity: 59'59.99" Measuring modes: Elapsed time split time 1st-2nd place times Hourly Time Signal Auto Calendar (pre-progr This item cannot be shipped to APO/FPO addresses. Please accept our apologies. 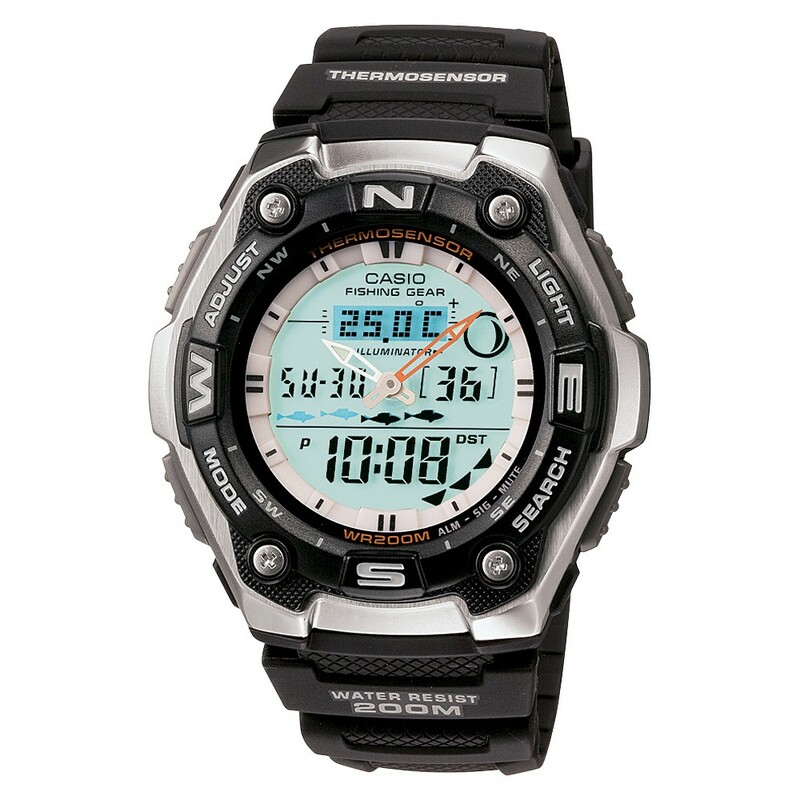 Casio Twin Sensor: Digital compass/Thermometer Watch. World time EL backlight 1/100-second stopwatch Countdown timer 5 daily alarms Low-temperature resistant (-10 C/14 F) 200m water resistance. 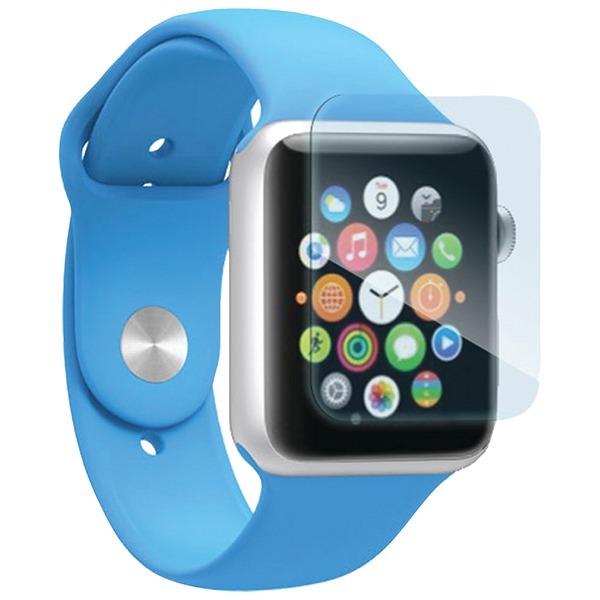 Case / bezel material: Resin / Aluminum Leather/Cloth Bands. This item cannot be shipped to APO/FPO addresses. Please accept our apologies. Casio Twin Sensor Watch. This watch has twin sensor capability Altimeter/Barometer and Thermometer. It also is low temperature resistant. 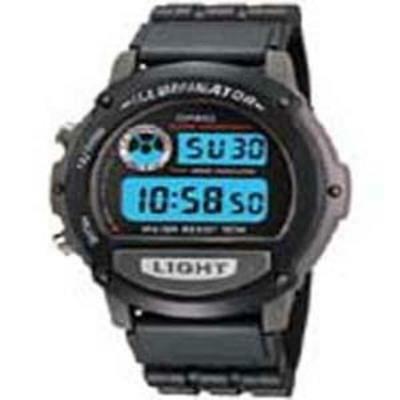 It has LED light with world time 5 daily alarms 1/100 second stopwatch and countdown timer.. 100M Water Resist. 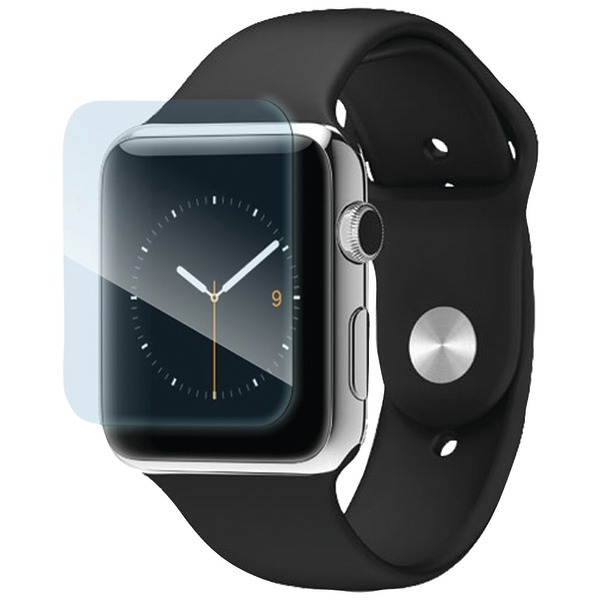 Black resin band with a neutral face and a digital dial code. This item cannot be shipped to APO/FPO addresses. Please accept our apologies. 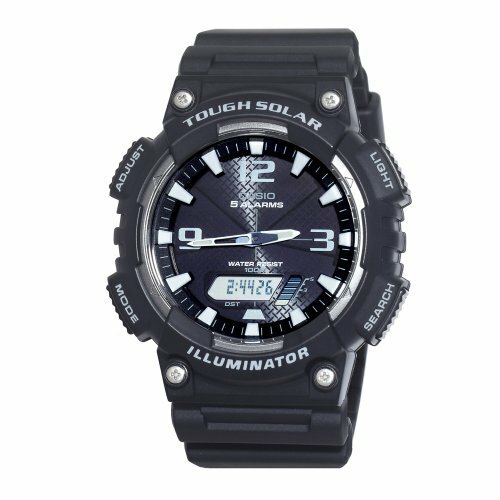 Casio Tough Solar Ana-Digi Watch ... Utilizing a unique Self- Charging solar power system this sporty analog/digital combination model provides plenty of functionality. A host of features such as 48-city world time 5 alarms stopwatch and dual countdown timers make this a versatile timepiece for almost any sport outing. Silver stainless steel band analog and digtal watch with black face. 100M water resistant World time (48 city) Dual countdown timers (for interval training). This item cannot be shipped to APO/FPO addresses. Please accept our apologies. 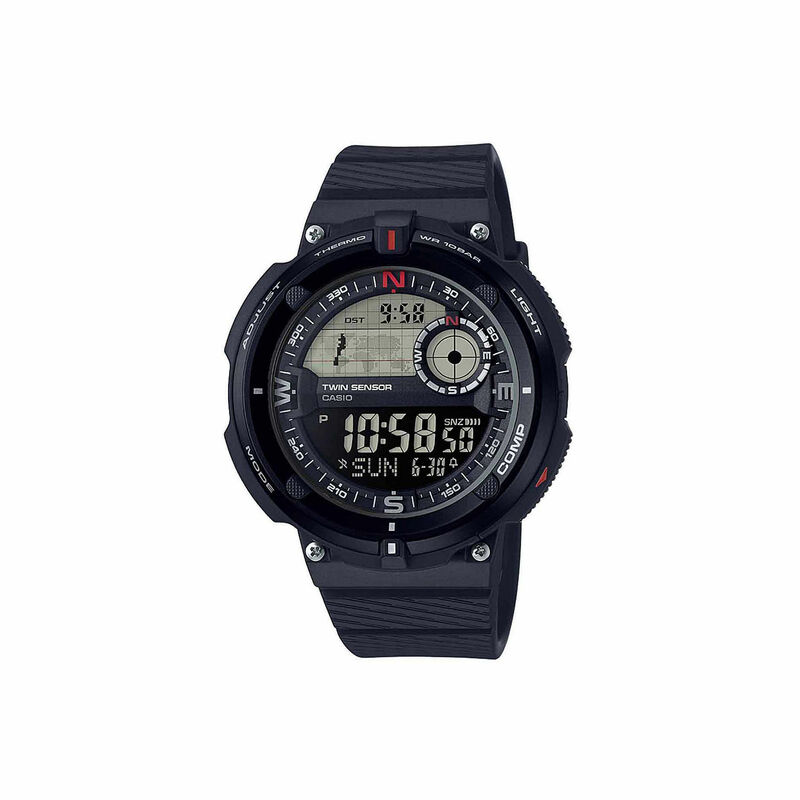 CASIO ANA-DIGI SOLAR WATCH. Black resin band solar digital analog watch with black & white face. Utilizing a unique Self-Charging solar power system this sporty analog/digital combination model provides plenty of functionality. A host of features such as 48-city world time 5 alarms stopwatch and dual countdown timers make this a versatile timepiece for almost any sport outing. 100M water resistant. This item cannot be shipped to APO/FPO addresses. Please accept our apologies. Sound Therapy with White Noise and Natural Sounds 345s for 6 Sound Tracks USB output for Mobile Charging 1A 5V Digital Tuning FM Radio 20 Station Memories Easy-to-Read 1.8 Blue LED Clock Jumbo Display 4-Level Dimmer Control Dual Alarm Week Indication & Choice of 3 Alarm Modes: Every Day Weekdays Only or Weekends Only Patented SmartSet Automatic Time Setting System Automatically Sets Itself to the Correct Year Month Date Day and Time as Soon as You Plug it In and After Every Power Interruption Button Cell Battery (Included) Maintains Time & Alarm Settings Displays Month/Date at the Touch of a Button Automatically recognizes DST Wake to Radio or Buzzer Alarm with Preset Volume Control Programmable Sleep-to Music Timer (10 90 mins in 10 mins step default 10 mins) Snooze/Repeat Alarm Digital Volume Controls for Radio AUX-IN Crescendo Wakeup Control Output Power: 140mW x 1 @10% THD Wide-Range Dynamic Speaker Built-In FM Antennas This item cannot be shipped to APO/FPO addresses. Please accept our apologies. 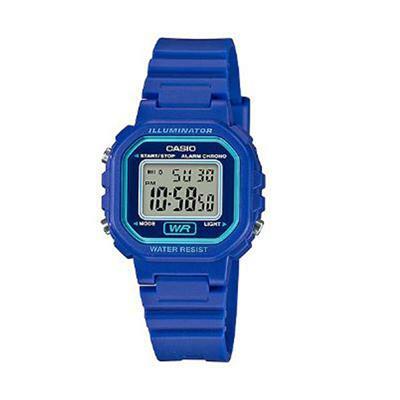 Casio Ladies Color Digital Watch - Royal Blue This item cannot be shipped to APO/FPO addresses. Please accept our apologies. 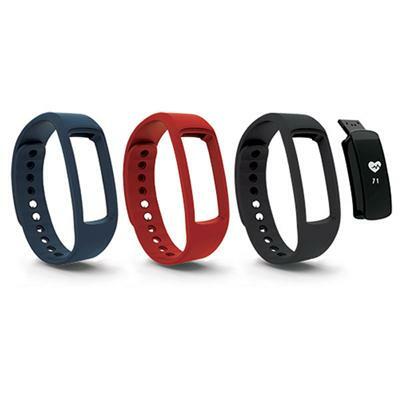 BT Smart watch with Heart rate monitor. This item cannot be shipped to APO/FPO addresses. Please accept our apologies. Twin Sensor Digital - Casio This item cannot be shipped to APO/FPO addresses. Please accept our apologies. Waveceptor Watch / Black Band - Watch self-adjust the time by receiving atomic signal. 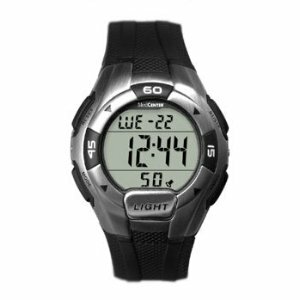 It is 200M water resistant with EL bakclight world time daily alarm and has 1/100 second stopwatch with countdown timer. This item cannot be shipped to APO/FPO addresses. Please accept our apologies. 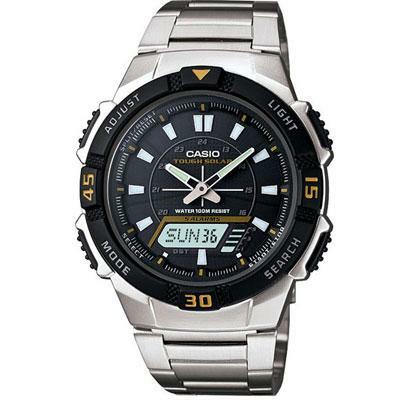 Casio Water Resistant 1/100 second stopwatch Measuring capacity: 59'59.99" Measuring mode: net time countdown timer measuring unit: 1/10 second Daily alarm Hourly time signal Auto-calendar Accuracy +- seconds per month. This item cannot be shipped to APO/FPO addresses. Please accept our apologies. 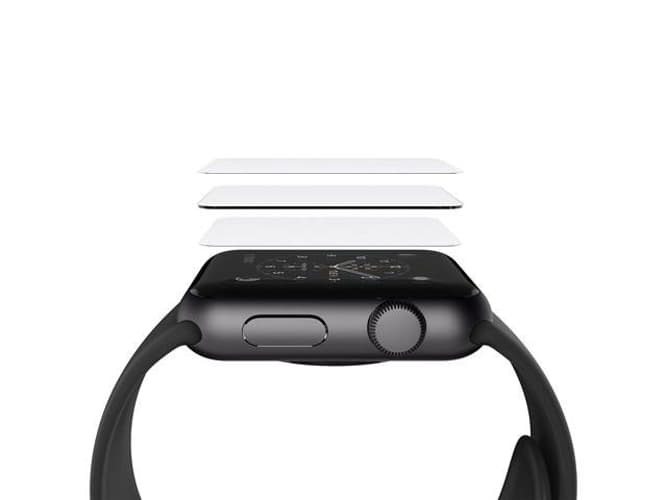 ScreenForce InvisiGlass Advanced Screen Protection for Apple Watch (42mm) This item cannot be shipped to APO/FPO addresses. Please accept our apologies. 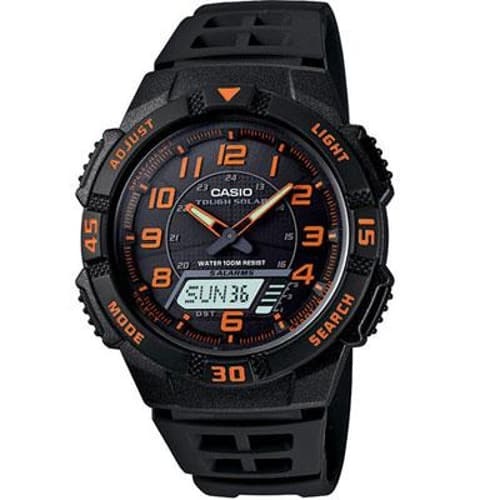 Casio Analog Watch - Classic diver-style design with multi-dial face. Resin band date display mineral galss crystal and Rotation Bezel. (Not a professional divers watch) This item cannot be shipped to APO/FPO addresses. Please accept our apologies.